When it's a giant plasma television screen you're in the market for, there's only one question: "how big have you got?" Panasonic intends to up the ante for this market with their new 103" plasma TV. 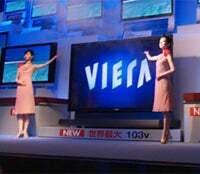 The Viera TH-103PZ600 (we call him "Gigantor, the Destroyer") features a 1920x1080 resolution, 16:9 aspect ratio, 4000:1 contrast ratio, analog and digital tuners, and will be available in Japan on the 1st of September for 6,000,000¥ ($51,000). But since Americans can obviously afford to pay more and wait longer, the USA retail price will be $70,000 in December. You know, just for kicks. Around 5000 units are being manufactured, and I imagine they'll be flying off the shelves. So watch out, or you might be crushed. Meanwhile, my 27" Sony CRT from approximately 1992 is starting to look smaller and smaller. Then again, at least it will fit in my apartment. Now that the "how big have you got?" question has been answered, the only query left is "Blu-Ray or HD DVD?"